ukactive CEO Steven Ward has championed Fit-Tech’s vital role in improving health outcomes “from cradle to grave” – easing pressure on a stretched NHS. Speaking at the launch ukactive’s start-up accelerator programme ActiveLab on Tuesday night (18 April), he said the latest cohort is capable of integrating activity at every stage of life, from youth to old age. Steven opened proceedings for the ActiveLab launch event at Plexal City in Stratford, East London, where the Fit-Tech disruptors selected to be part of the programme were introduced to an audience of 120 leaders from the worlds of finance, business, technology, health, fitness and sports. From a platform that allows elderly users to cycle virtually through their old neighbourhoods, to a digital health and wellbeing coach for pregnant women and mothers – the start-ups took to the stage to introduce their products and highlight how they are helping to overcome a range of barriers to physical activity. ukactive CEO Steven Ward said: “Imagine tech that could break down the barriers to activity for vulnerable populations – young children, pregnant women, the elderly. “Imagine technology that integrates physical activity in everyone’s lives from cradle to grave – keeping us happy, healthy and out of hospital, easing the long-term pressures stretching our NHS. “The start-ups joining ActiveLab have the potential to help deliver this vision. “We are delighted to officially introduce this year’s pioneering ActiveLab start-ups, drawn from across the globe and capable of completely revolutionising the way that people of all ages get active. Prior to the introduction of the ActiveLab cohort, Plexal Chief Marketing Officer Thomas Messett analysed the investment landscape for budding start-ups – identifying opportunities for tech and innovation to capitalise on the increasing health needs of modern economies. This preceded a fascinating panel discussion featuring Loretta Sollars from Public Health England and Rowan Conway from the Royal Society of the Arts, as well as Leon Rudge and Arthur Morris from partners Life Fitness and Jonas UK respectively. 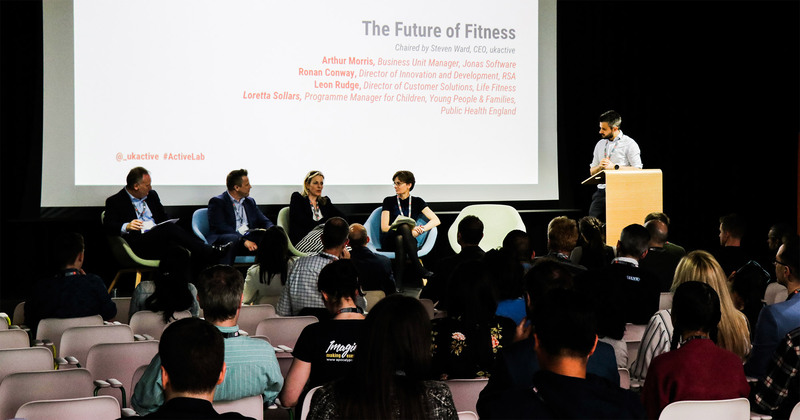 The debate examined the ‘Future of Fitness’, with panellists noting that Government can be a partner rather than a roadblock to growth, and how start-ups should focus on addressing wider societal issues rather than penetrating markets, in order to achieve real long-term success. The ActiveLab start-ups will now undergo a 12-week programme which includes expert training, strategic development, account management support and access to a vast network of fitness and technology partners. ActiveLab culminates with ActiveLab Live! which will see the Fit-Tech start-ups battle it out in a live-pitch competition at Manchester Central on the 21st June. The event forms a key strand of Active Uprising – ukactive’s new festival of physical activity that takes place in Manchester from the 21 to 23 June.